This trip including the return transfer from Kuala Lumpur to Gopeng. 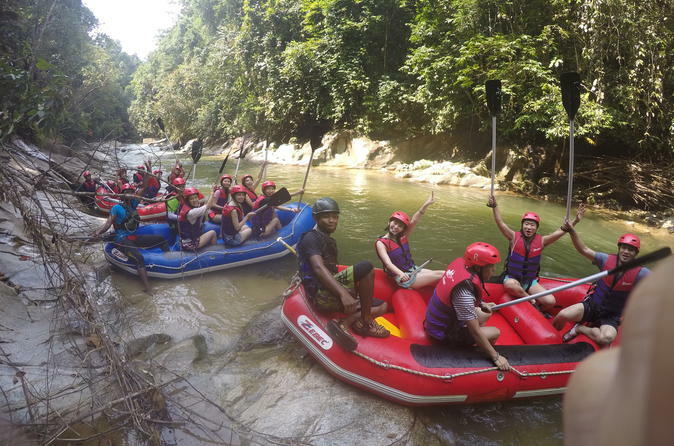 Enjoy a thrilling White Water Rafting and Waterfall Abseiling adventure in the Gopeng Rainforest, one of the hottest destination for rafting and picnic. You can explore and experience the scenic of Kampung Road and Gopeng Town, Unique lorry transport into starting point, White Water rafting activities and picnic lunch. Enjoy a thrilling White Water Rafting and Waterfall Abseiling adventure in the Gopeng Rainforest - the hottest destination for White Water Rafting. Worry not as each raft will have an experienced facilitator traveling with you. Enjoy the cooling water splashing and gushing that hits you and raft when hitting the rapids falls!